Bowater's: A history we are proud of and a future we are sure of. The Bowater Motor Group was formed in the late 1940's as a mechanical and auto electrical service when local man Raymond Bowater returned home to Nelson after serving in the Second World War. The site was in central Nelson at the back of the building that is now the Suburban Bus depot. The standard Triumph franchise was obtained, and in 1951 the Armstrong Siddley, followed in 1952 by the Studebaker franchise. When Raymond Bowater retired in 1977, Rodney Bowater was appointed Group Managing Director. The company expanded and obtained franchises for Nissan, Honda, Peugeot, Audi, Volvo, Jaguar, Rover, Landrover, Fiat, Volkswagon, Renault, Alfa, Panther, Hino, Lancia, Maserati and Leyland Heavy Commercial. 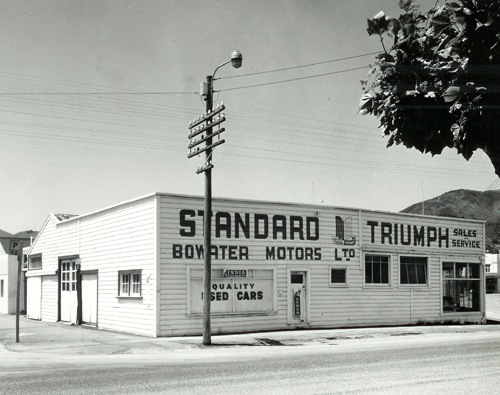 With the addition of the Motueka Dealership, Bowater's has became Nelson's largest vehicle company. Rationalised with the purchase of the Toyota franchise in 1990 The Bowater Group now operates Bowater Honda in Nelson, and Bowater Toyota in Nelson, Richmond and Motueka and has recently added Bowater Hyundai in Nelson to its very strong locally owned group of companies. Continuing on with the true focus the Bowater Group has achieved several awards and merits of achievement within the major franchises - Toyota, Honda and Hyundai. The solid Toyota franchise was enhanced with the addition of one of the world's most recognised quality fanchises - LEXUS, and has also recently been bolstered with the Daihatsu make of vehicles, giving the new car buyer absolute choice. The Bowater Group now delivers more new vehicles to Nelson people than any other company. Bowater's is the company you can rely on for all your motoring needs; New and Used vehicles, Service, Parts and Finance.